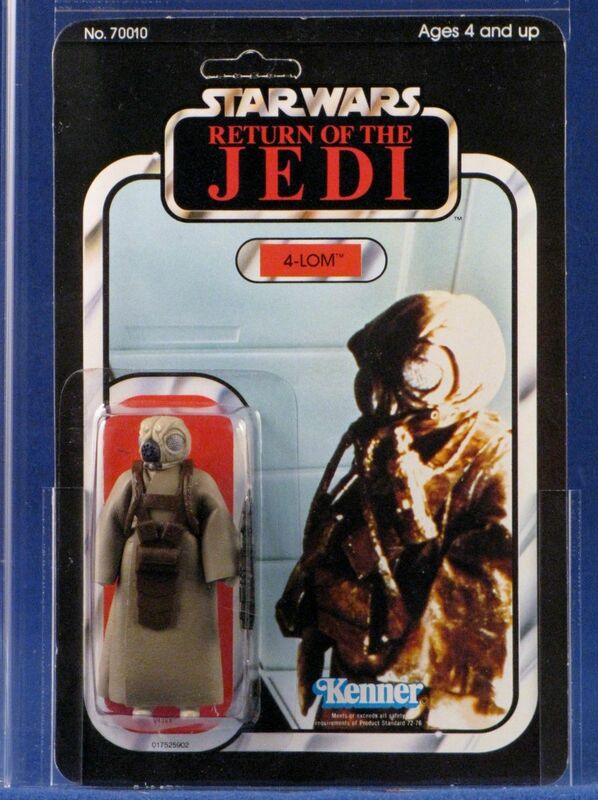 4-LOM, the last figure on an ESB cardback. 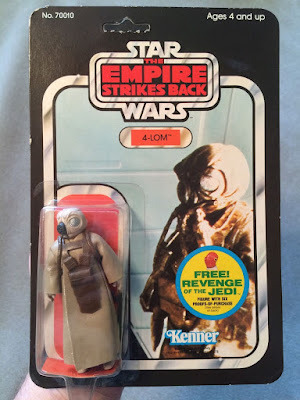 Anyone who follows these posts will know that I always try to find every ESB cardback variant to report against for the character of the month. 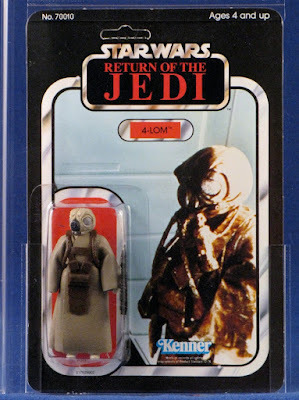 Writing these posts has made me aware of all the variants across the ESB line...but not so on the ROTJ cardbacks. 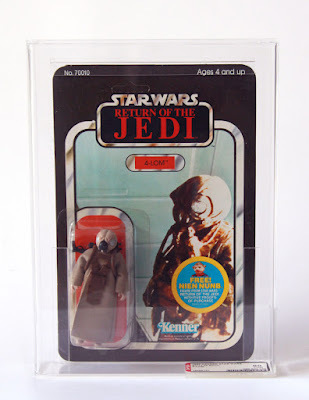 But, that's the great thing about this hobby, there's always something to learn, so I am looking forward to a deeper dive into the ROTJ cardbacks. 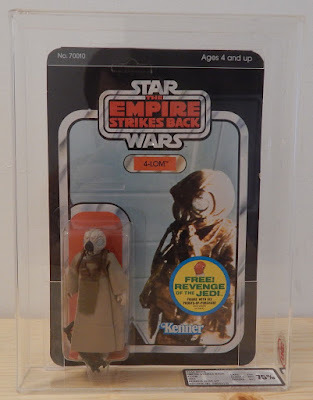 I wasn't able to find a high end ESB cardback... which was a shame as that's where the crazy pricing exists. I would say though the $400+ for the 48C ungraded with a price sticker did seem high (but not unsurprising in the current market). Pricing tailed away pretty quickly after that. Quite a few graded ROTJs, which did fetch reasonable pricing (for the seller). As usual there was a decent amount of low end MOC's that went for well under $100. And there ends the ESB characters from a MarketWatch perspective. 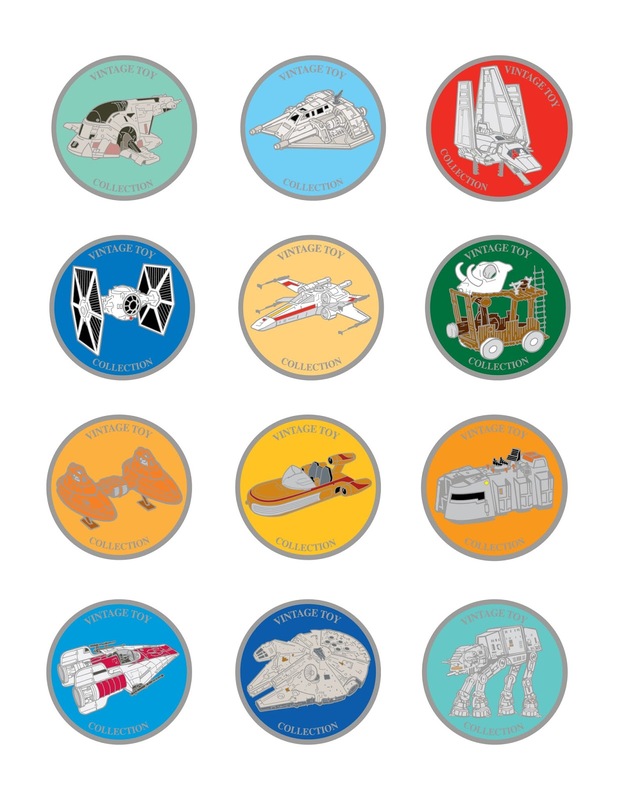 It's been a few years since we started tracking the ESB characters, and the market has changed significantly since then (thank you Disney). 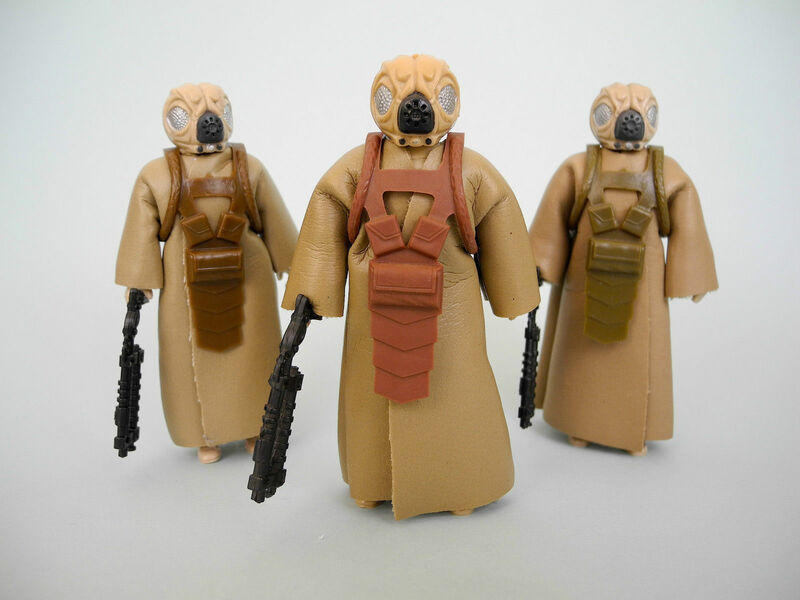 I'll be interested to see what the ROTJ figures bring us...there's lots of main characters, but with a decent assortment of background aliens (and for the most part on yellowed bubbles I'd dare say we find some cheap MOC's in the coming reports). Until next month, happy buying and selling. Wampa Wampa!! Announcing the Celebration Europe 2016 Collector Track Medallions! 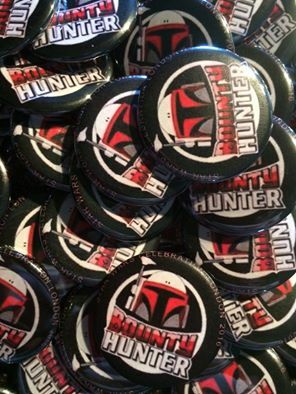 Continuing with the tradition of awesome giveaways, the Collecting Track will be handing out enameled medallions at the panels! Absolutely free! 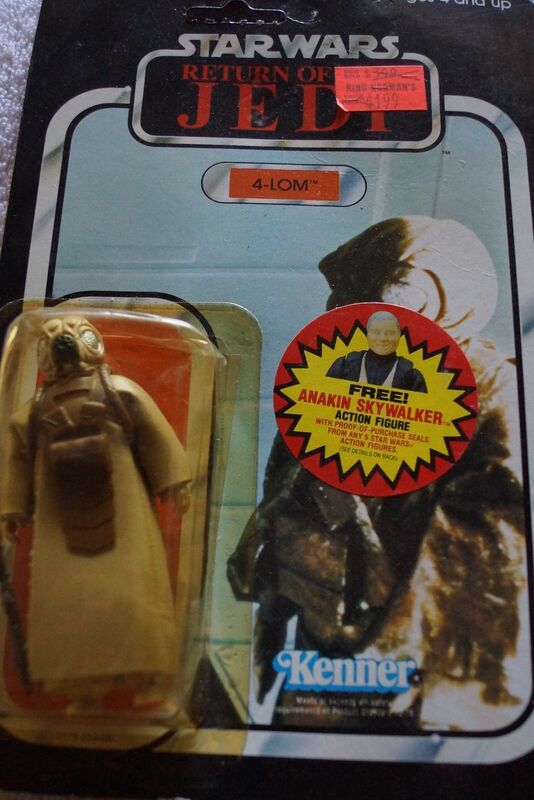 Each pewter medallion shows a detailed view of a vintage Kenner Star Wars toy! 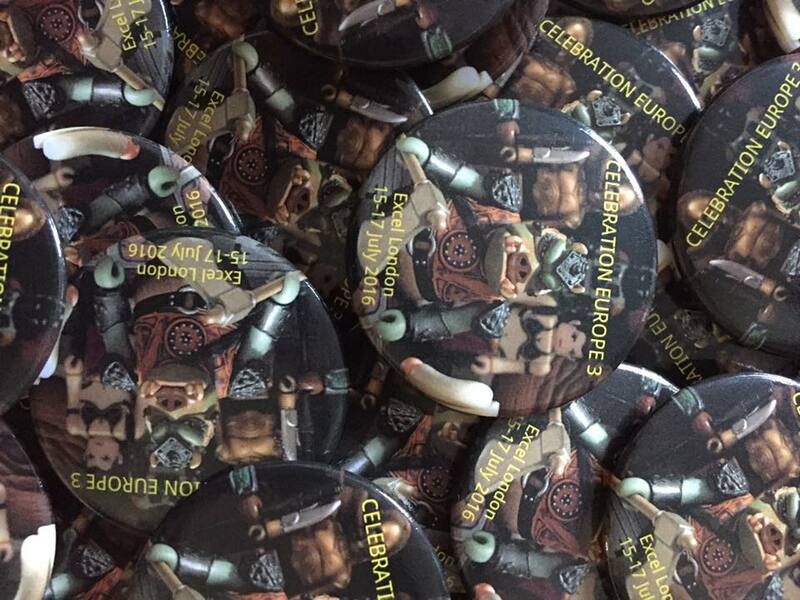 They will make awesome companion pieces to both our popular Star Tot and Celebration Medallion giveaways of the past, and are something that you can appreciate for years to come! 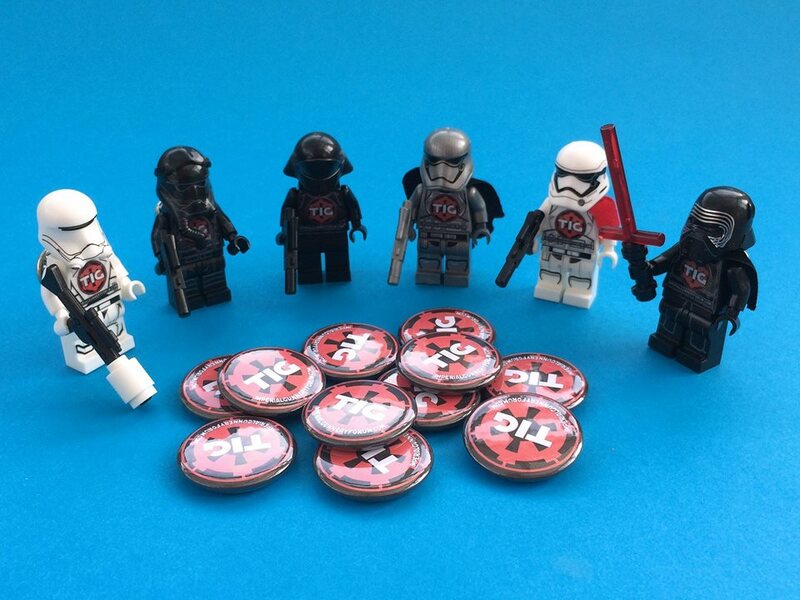 Collect all 12! To celebrate the anniversary of the original releases of Star Wars and Return of the Jedi on May 25th, 2016, a previously obscure and for the most part undocumented British teaser trailer for Revenge of the Jedi was released by the Academy of Motion Picture Arts & Sciences via YouTube with an accompanying post detailing its historical context on Oscars.org. 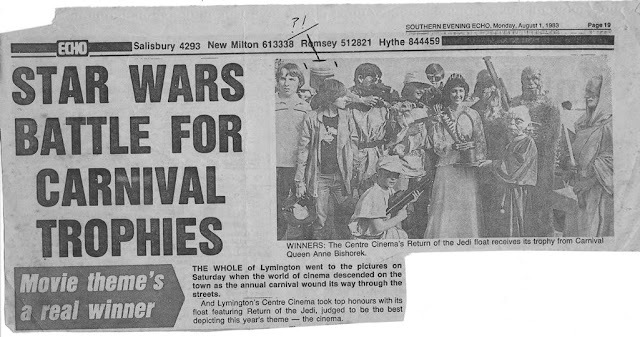 Over the following hours and days, the trailer which hadn't been seen by the public since 1982 caused quite a stir and received substantial attention in various online media outlets. 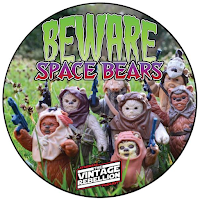 To see such a short, stark, and simple little teaser that offers tantalizingly little to viewers at face value be the subject of such commotion speaks to the staying power of Star Wars as a pop culture phenomenon. What really makes this seemingly unexceptional artifact special, however, is where it fits within the larger timeline of Star Wars and its marketing as a franchise with worldwide success. 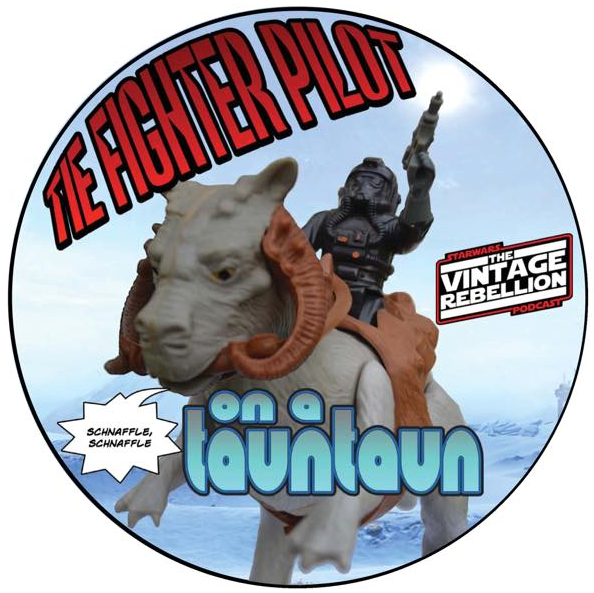 I had the privilege of collaborating on this project with Pete Vilmur, longtime SWCA Editor and current Senior Writer & Fan Relations at Lucasfilm -- without whom the identification of and backstory on the teaser would not have been possible to confirm. While the major components of the trailer's origins are covered in the piece we co-wrote for the Academy website, I realized there were several aspects of the story that deserve to be told as far as its interesting past, its discovery, and ultimately, its preservation. 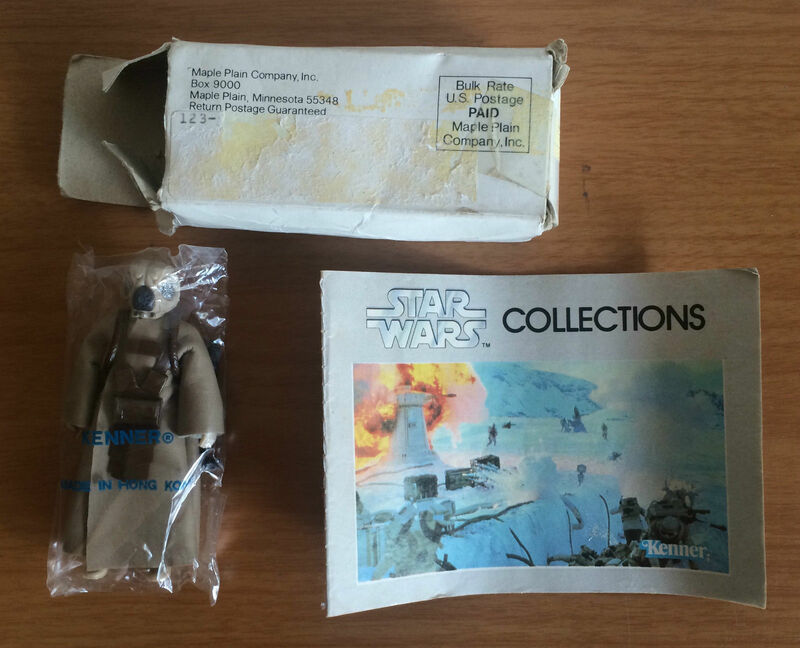 With the Archive being a collecting-focused website, the Star Wars collecting community's role in the trailer resurfacing is an appropriate place to begin. The truly key player in all of this is Bill Gould, a former cinema projectionist who worked in Hampshire, England and had been the trailer's owner and caretaker for over 27 years. 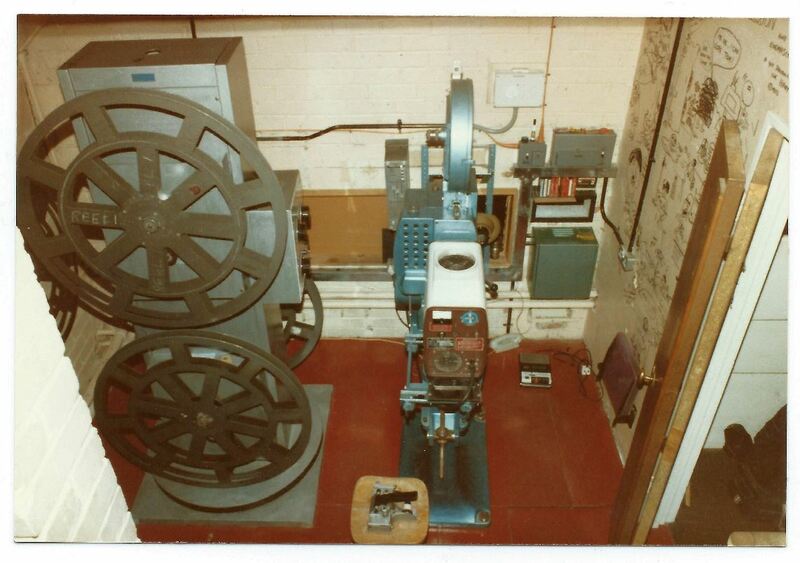 Gould had uncovered it in a projection booth at the Centre Cinema in Lymington where he began working in 1983. It was spliced among hundreds of feet of countdown leader and footers on a partially filled 2000 ft. reel containing several other trailers and advertisements. 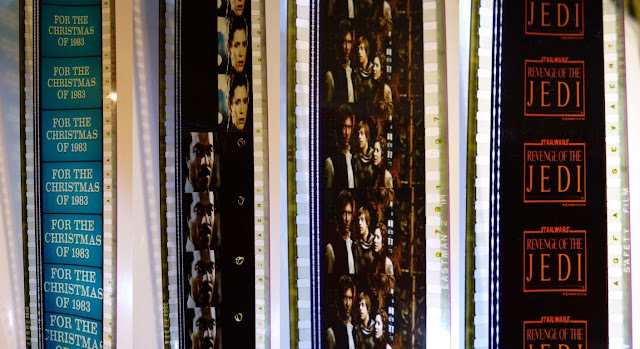 Intrigued, he separated it from the reel and threaded up the projector for a test viewing after the current film's attendees had vacated the theater. 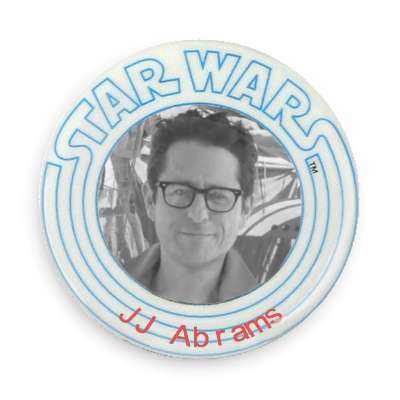 Several years later when he left his position at the cinema, it was given to him as a parting gift along with a thank you note for the time he had put in. An avid Star Wars fan and collector, Gould (pictured in the upper left disguised as the nefarious bounty hunter Boba Fett) and his Centre Cinema colleagues received "top honours" for their Return of the Jedi float in the town's annual carnival in August, 1983, which was aptly movie-themed. 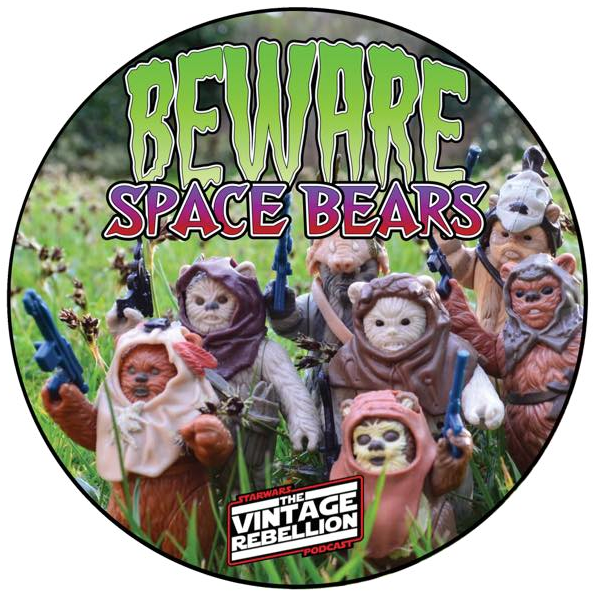 Flash forward to November, 2015 where Gould had posted images of the peculiar 35mm print on the Rebelscum Forums - a longstanding hub of Star Wars collecting discussion and activity. It was here that both Pete and I became aware of the trailer, and as the details of its physical characteristics and provenance emerged, it became clear that what he had was certainly unique, and quite possibly very rare. 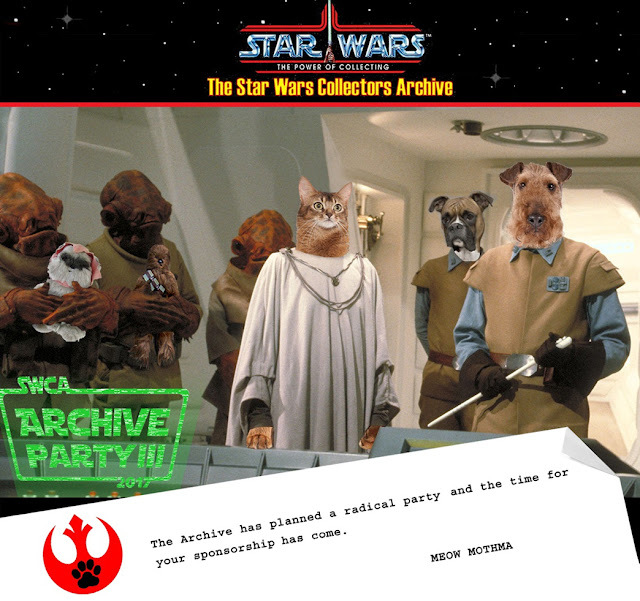 In the process of corresponding with Bill and attempting to concretely identify the trailer, I proffered the option of providing an archival home for it in the event that he was ever interested. Having worked at the Academy Film Archive as a cataloger for the past few years, this was the first opportunity I'd had to extend any agency in terms of helping to conserve something, let alone an item that held such personal meaning for me as a Star Wars enthusiast. Despite other offers from understandably interested parties, Bill informed me a few months later that he was ready to part with the trailer and I was able to arrange for it to be added to the Academy's collection. Where things would go from there was undetermined at the time, but I was hopeful that due to its likely significance (and its short length), it could at least be digitally transferred without great cost and possibly shared with a wider audience. It was at this point that I reached out to Pete Vilmur to not only amass as much background information about the trailer and its relation to Return of the Jedi's British release as I could, but also to gauge the probability of gaining Lucasfilm's approval for the Academy to share it publicly. By this time, Pete had already been conducting his own research into the company's marketing files, which like so many archives proved to be of incredible value. 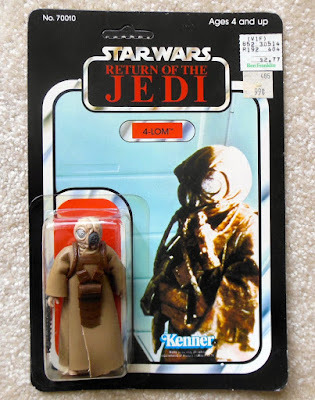 In addition to explaining the trailer's title cards advertising a Christmas 1983 release (as discussed in the original post on Oscars.org), the documents that Pete unearthed shed light on related merchandising matters that collectors might find of interest. 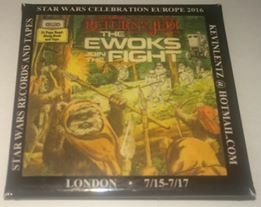 According to a meeting journal from late April, 1982 (a month before the U.K. Star Wars/Empire Strikes Back double-bill premiered with the Revenge teaser) which documented a consultation between Kenner and European marketing specialists, British toymaker Palitoy -- which had been manufacturing and distributing licensed Star Wars toys in England since 1978 -- was "concerned about the Christmas release of Jedi as it [would] severely hamper their toy sales." 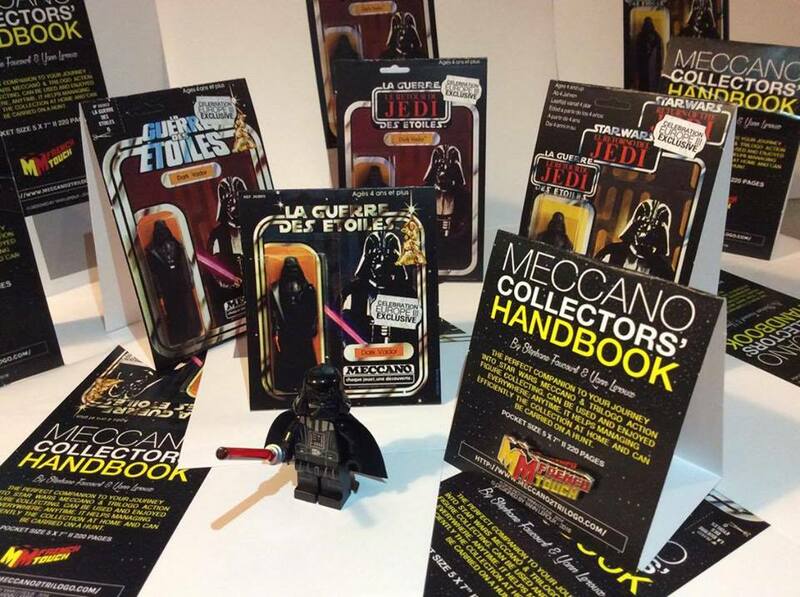 An annotation on the notes suggests that European toy companies actually preferred a Christmas release. This original confusion or miscommunication notwithstanding, all contingents would eventually agree on a summer release date. 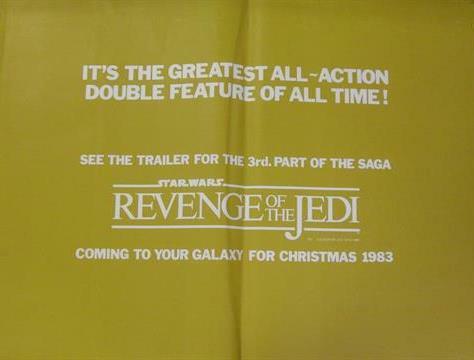 Another critical clue that aided in dating the trailer came in the form of the above initially unidentified double-bill poster image that Bill had saved from an internet search which advertised a Revenge of the Jedi trailer and a Christmas 1983 release for the film. 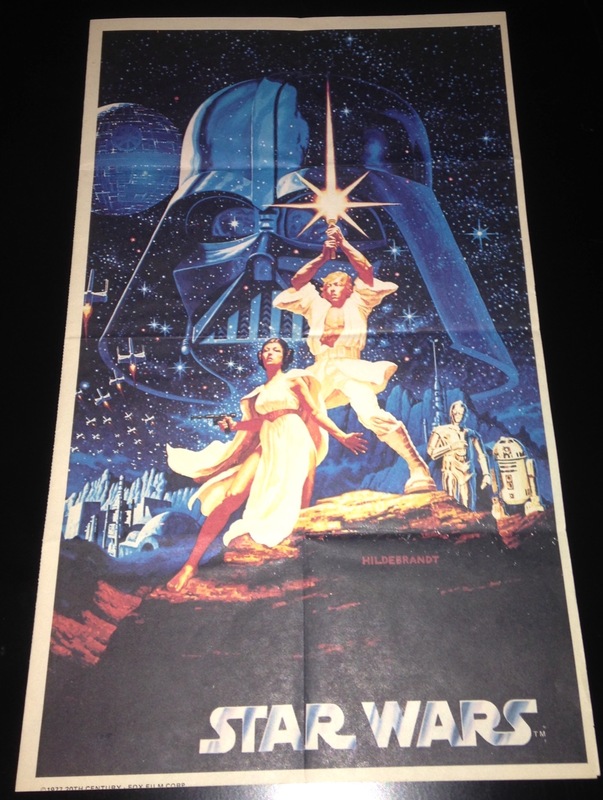 With help from Pete, this was pinpointed as an extremely scarce snipe poster included in a rare six-piece Marler Haley ensemble for the May, 1982 Star Wars/Empire Strikes Back British double-bill. 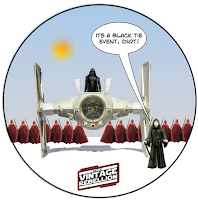 Without the subsequent images provided by Steve Sansweet at Rancho Obi-Wan, a principal piece of the puzzle would have been absent and the impact of the trailer's reappearance would have suffered. Short Film Preservationist Tessa Idlewine, who coordinated the digital preservation, inspects the original print. 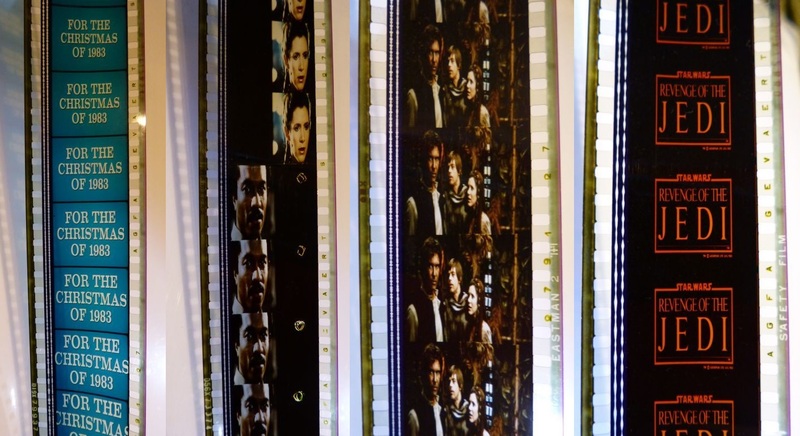 On the preservation front, the original 35mm print was scanned frame by frame at 2K, resulting in preservation-quality files that were also shared with Lucasfilm's film archive department. Aside from some minor color correction with the main title card (which needed a bit more of that Revenge red), the trailer's intrinsic imperfections were left as they were. It's remarkable how much energy can go into something which by all appearances is relatively inconsequential. 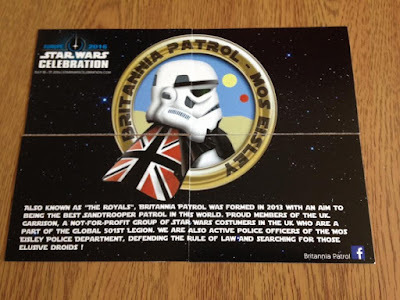 It took a genuinely collaborative effort from a team of individuals representing multiple constituencies for this ephemeral piece of Star Wars history to be revived and protected for future generations. The trailer's mere 32 seconds may not seem all that impressive to contemporary eyes, but to imagine the excitement those 32 seconds must have instilled in those lucky British moviegoers getting a first look at a highly anticipated American blockbuster months before fans in the U.S. really puts things in perspective. This is why we do the work we do. Skye and Steve speak with Jonathan Robinson about his new Close Encounters of the Third Kind documentary, Who Are You People? 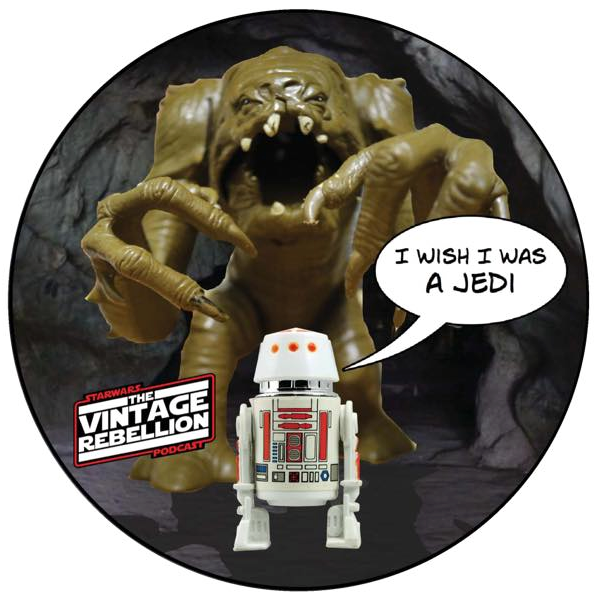 Plus we discuss his amazing collection of vintage toys. The only regular feature this month is the MarketWatch because it is an upside down, inside out Vintage Pod that was once much longer and much dirtier but it is now quite pleasant, thank you very much. 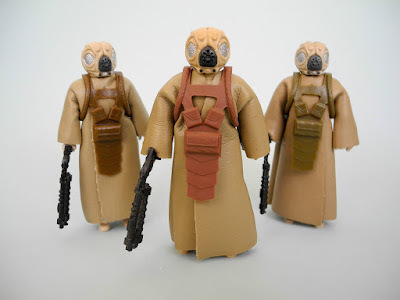 While the General Mills Fun Group (GMFGI) is probably familiar to most collectors of vintage Star Wars toys, few pause to wonder why a company known for producing sugarcoated breakfast crapola was in the business of making action figures. 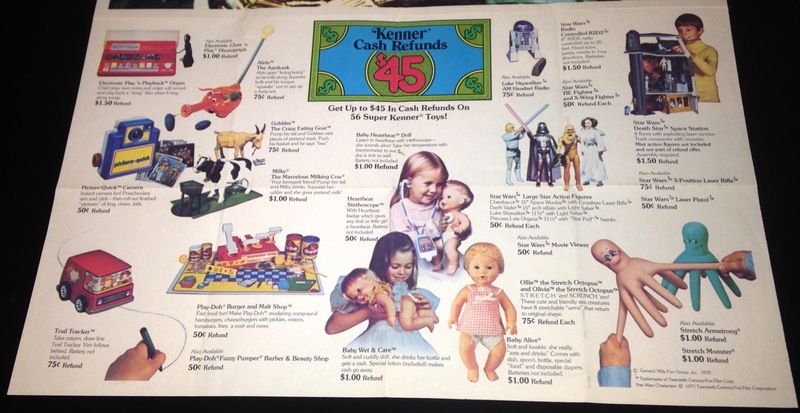 General Mills acquired Kenner in the late '60s, not long after the the cereal giant absorbed Rainbow Crafts, the producer of Play-Doh. GMFGI's acquisition of Parker Brothers in the early '70s brought yet another great asset under the umbrella of the Fun Group. As its name suggests, it was a subsidiary that focused on producing toys for children. If you think about it, the GMFGI strategy makes sense. As a major producer of breakfast cereals, General Mills knew how to sell edible junk to children and their parents. Why wouldn't they parlay that experience into selling non-edible junk to the same cohort? Doubtless, the cereal-toy coupling suggested a bevy of great marketing opportunities. 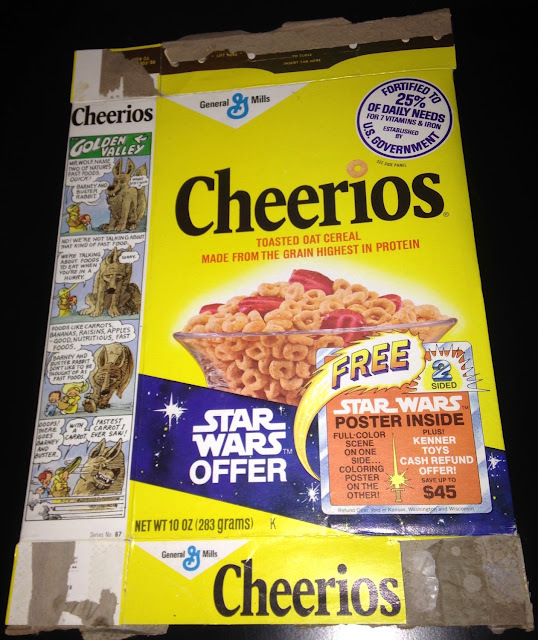 Now General Mills could promote their toys through their cereals and their cereals through their toys. You can almost see the marketing guys, garbed in leisure suits, rubbing their palms together and whispering "synergy." Adults everywhere were either too high on quaaludes or too distracted by Chico and the Man to recognize this as an insidious usurpation of parental privilege. And their kids weren't about to complain. 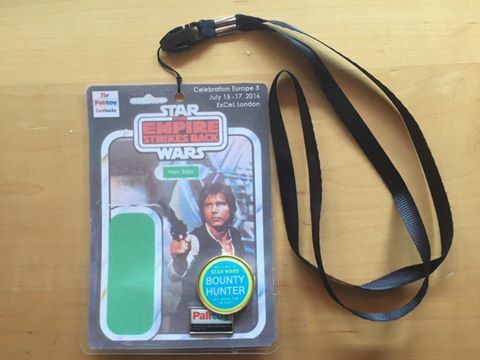 What self-respecting American kid objects to being exploited in the interest of sugar and toys? Anyway, in 1977 Kenner acquired a license to produce brightly colored trinkets in association with a movie called Star Wars. 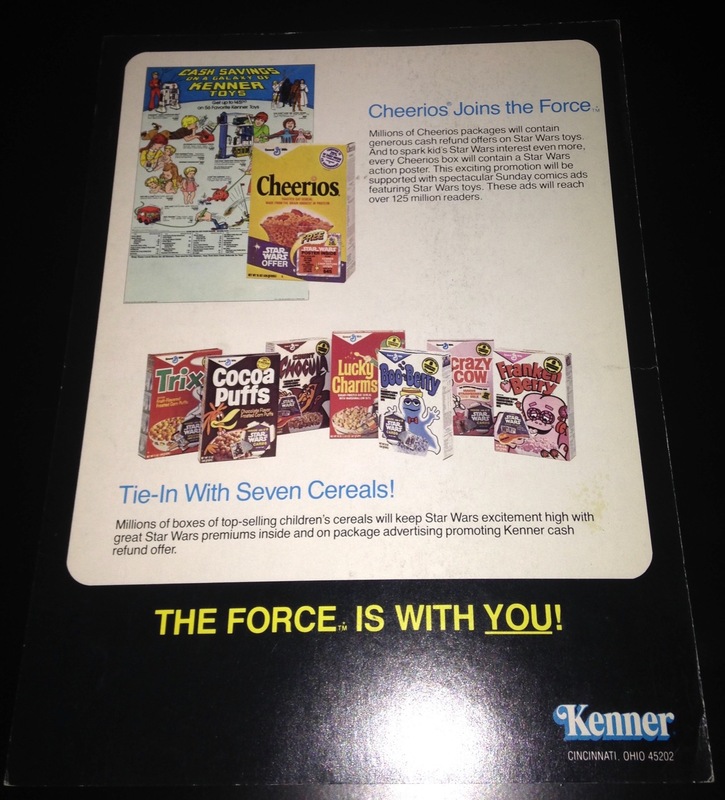 With the success of the film, an overlap of General Mills cereals and Kenner Star Wars toys became a near inevitability. 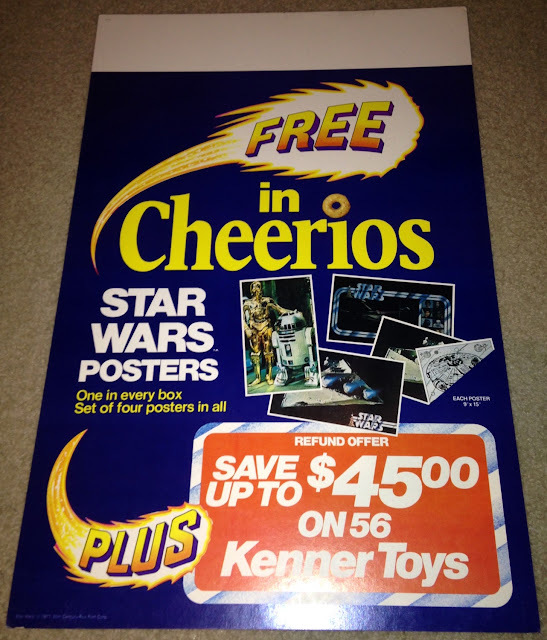 While the Star Wars-cereal crossover took a few different forms, the one I'll focus on here concerns a poster offer that appeared on boxes of Cheerios in the fall of 1978. Really, "poster" is a bit of a misnomer. 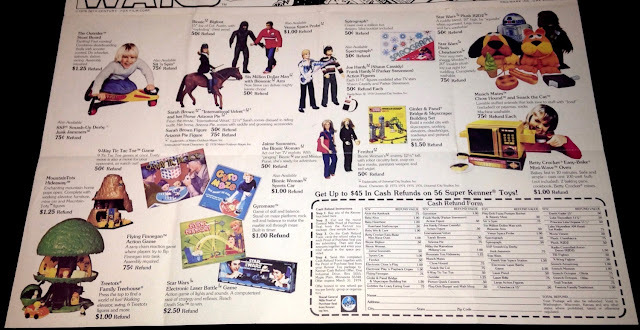 As we'll see, the item offered was a toy advertisement/coupon cleverly disguised as a decorative object. But as toy collectors we love toy advertising, so a loss for '70s kids is a win for us. 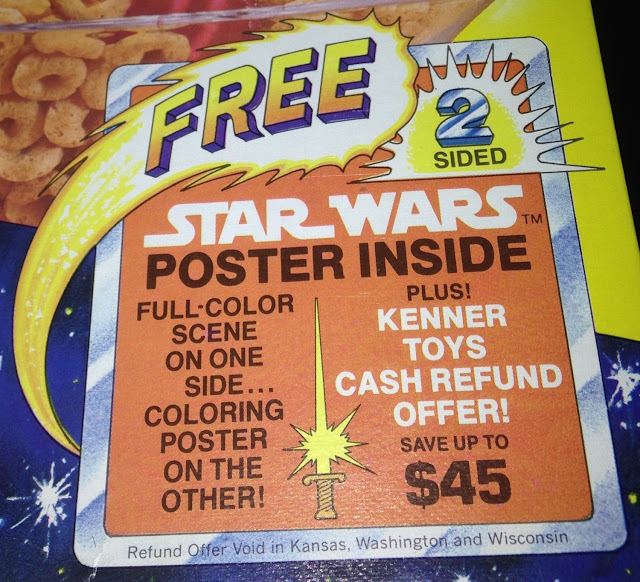 Along with the absolute worst representation of a lightsaber in the history of the graphic arts, the ad on the box's front featured a call-out boasting that the poster was two-sided, thereby alleviating the fear that General Mills would print these on the cheaper one-sided style of paper. Why, I wonder, was the refund offer not available in Kansas, Washington, and Wisconsin? Maybe because those states were on the wrong side of what I like to think of as the Lameson-Dixon line. 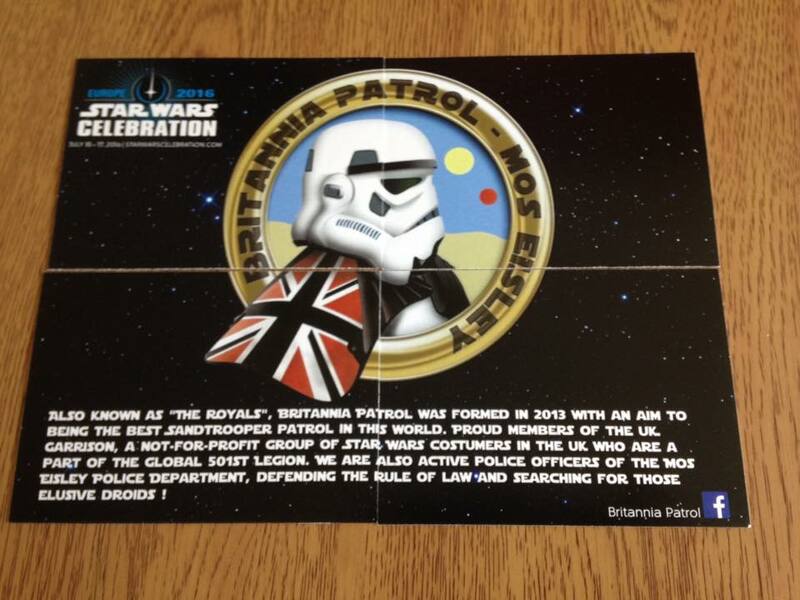 The reverse of the box provides additional information regarding the posters. 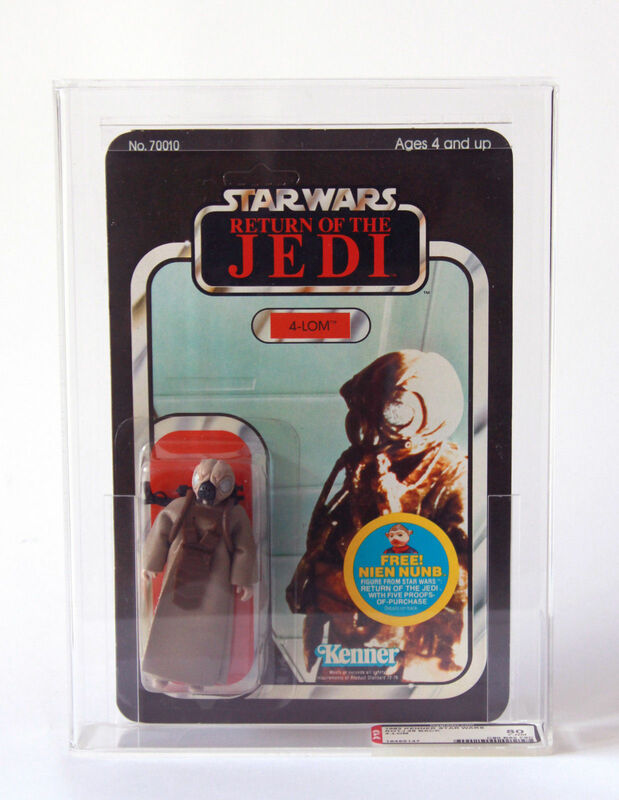 More importantly, it features representations of Kenner toys, including some of the earliest entries in the company's line of Star Wars large-size action figures. Kenner announced the promotion to wholesalers via this brochure, timed for the crucial holiday season. Its focus was consumer promotions connected to Star Wars. In addition to the cereal tie-in it mentions the well-known Burger Chef promotion as well as what became known as The Star Wars Holiday Special, then referred to rather vaguely -- and entirely fallaciously -- as a "thrilling Star Wars special." 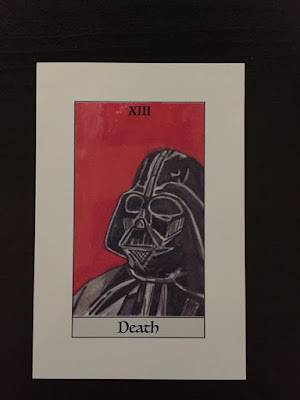 If you've seen the Holiday Special . 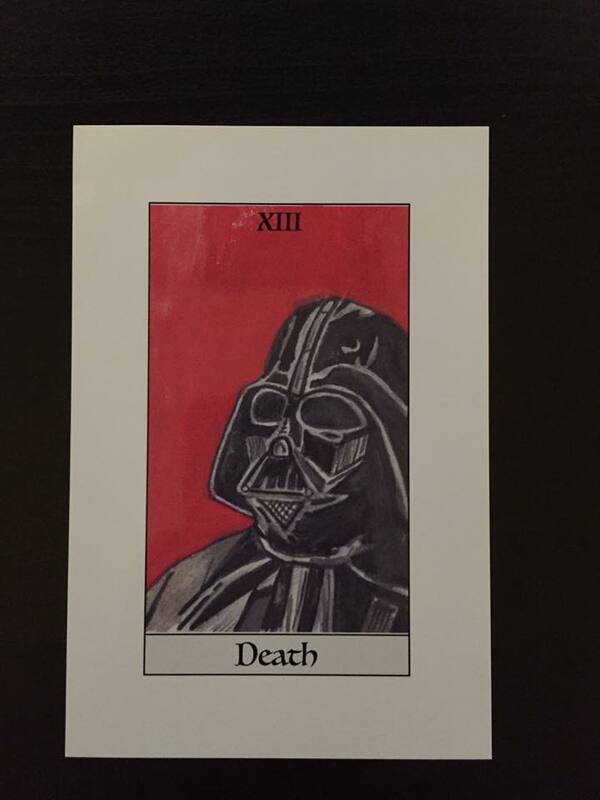 . . well, first off, allow me to express my deepest sympathies. 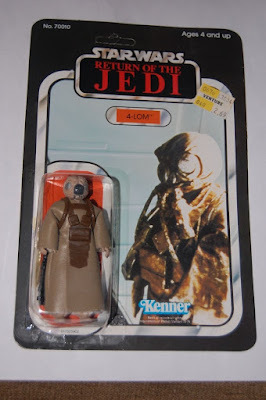 But if you've seen it you know that it wasn't thrilling to anyone but the wookiee grandfather who watched the hologram of Diahann Caroll impersonating Donna Summer. By the way, does anyone else find it funny that the whole world believes Donna Summer was in the Holiday Special even though the singer was played by Diahann Caroll? How, I wonder, does Ms. Caroll feel about this? Probably like Woody Harrelson when I told him I was convinced that he and Matthew McConaughey were the same person. 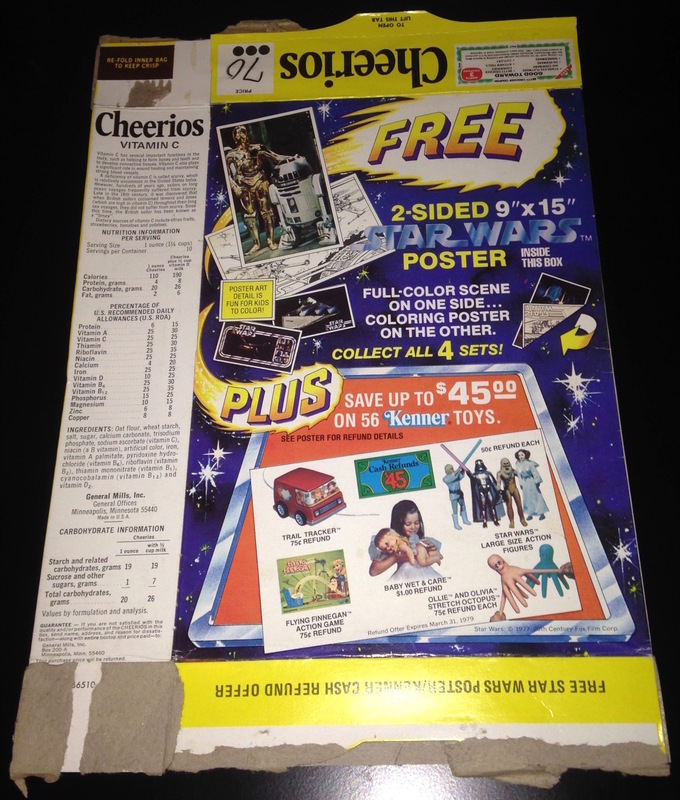 The Cheerios campaign is mentioned on the back of the brochure. So are some Star Wars-themed promotions that popped up on other brands of cereal marketed by General Mills. 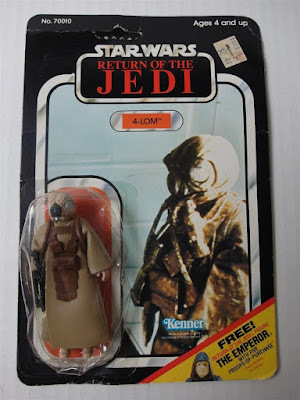 A fact as little recognized as it is true: Boo-Berry is the very first blue ghost associated with the Star Wars franchise. 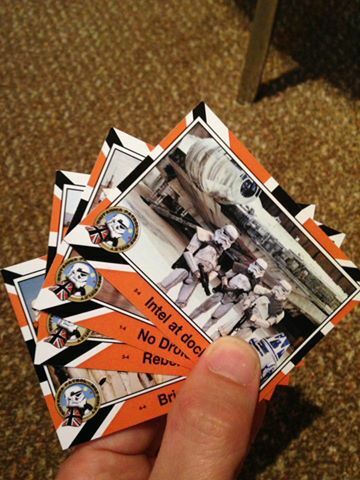 Try pulling that one out of your nerdlinger file the next time your friends invite you to Star Wars trivia night and you can't think of a decent excuse to stay home. 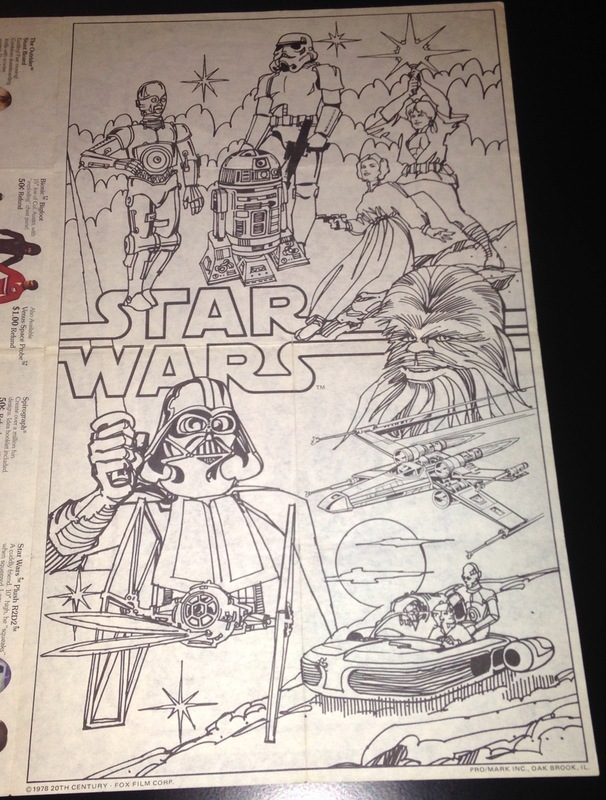 Note the mention of "spectacular Sunday comics ads featuring Star Wars toys." More on those below. As the box mentions, there were four different posters offered as part of the promotion. 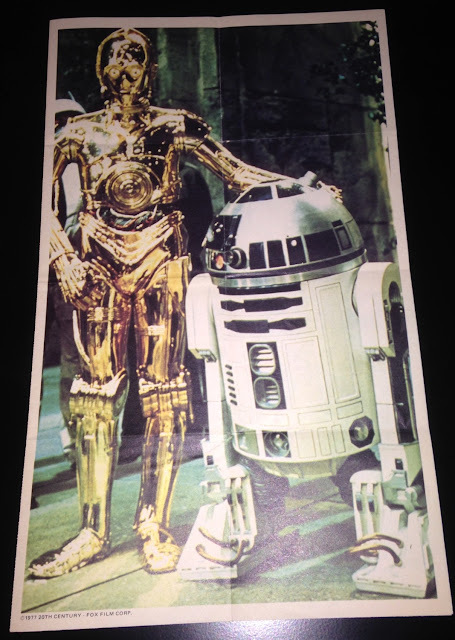 Here you see the example featuring R2-D2 and C-3PO. Above I made a crack about the posters being advertised as "two-sided." 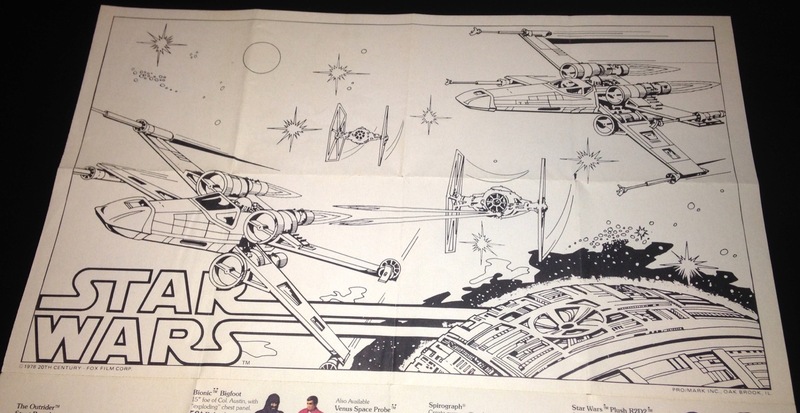 As this image shows, the reverse actually featured a pretty nice line-art illustration. It could be colored or enjoyed unmodified. So perhaps I was being a tad unfair. This particular image is pretty dynamic. I love that fabulously inaccurate rendering of the Death Star. 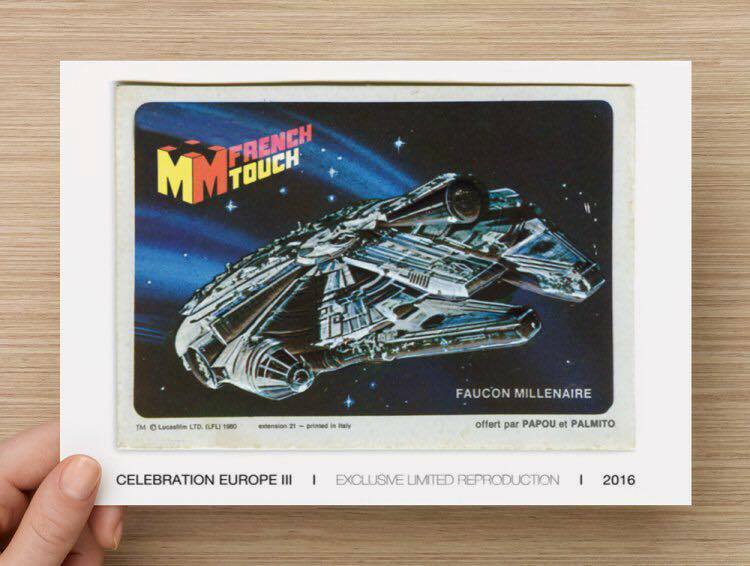 This poster features the famous piece of marketing art developed by the Hildebrandt brothers -- a pretty nice freebie! Actually, I wonder how the Factors people felt about this image being given away on a free poster. Factors, of course, had the rights to market it as a commercial poster, and it was a big seller for them. The reverse of the Hildebrandt poster boasts this nice and fairly film-accurate image of our heroes' escape from the Death Star. 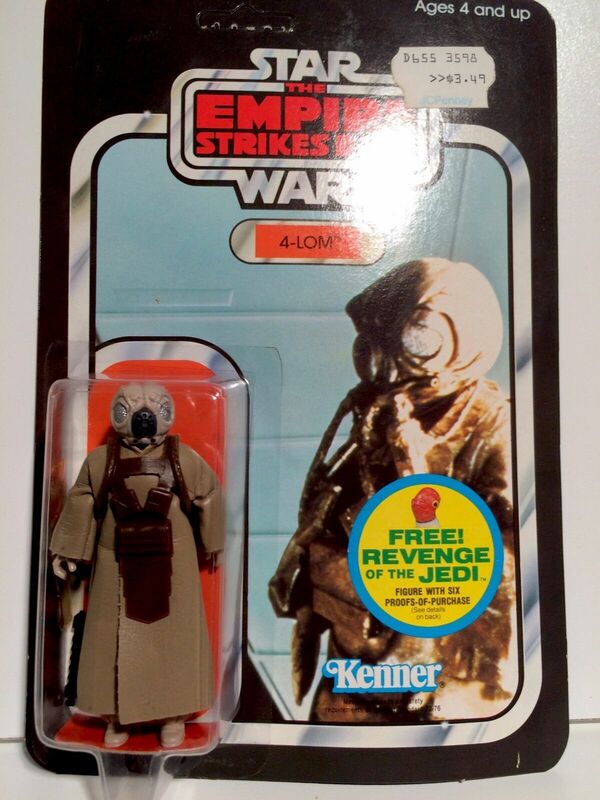 Speaking of escaping the Death Star, this image is sure to be familiar to all collectors of vintage Kenner paraphernalia. 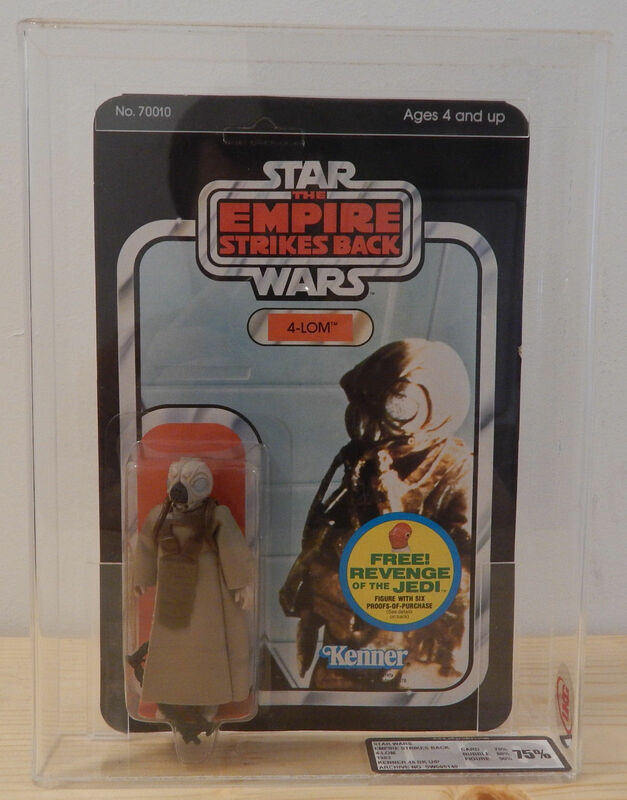 It features the design used on the box of the "Escape from Death Star" board game, one of the earliest, and most ubiquitous, of Kenner's Star Wars products. Remember, the folks at Kenner didn't have a ton of source images at their disposal. 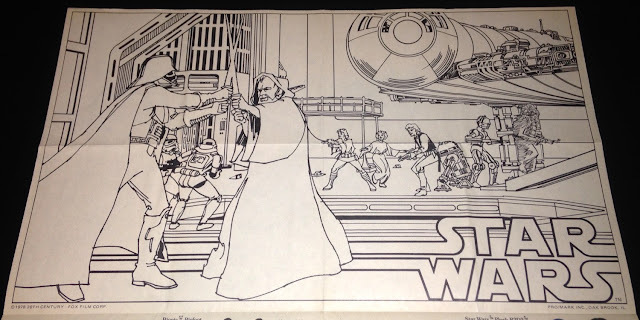 That fact, combined with the dimensions of the game's box, made this image a natural for use in this poster set. The reverse of this poster featured a pretty cool montage-style design. 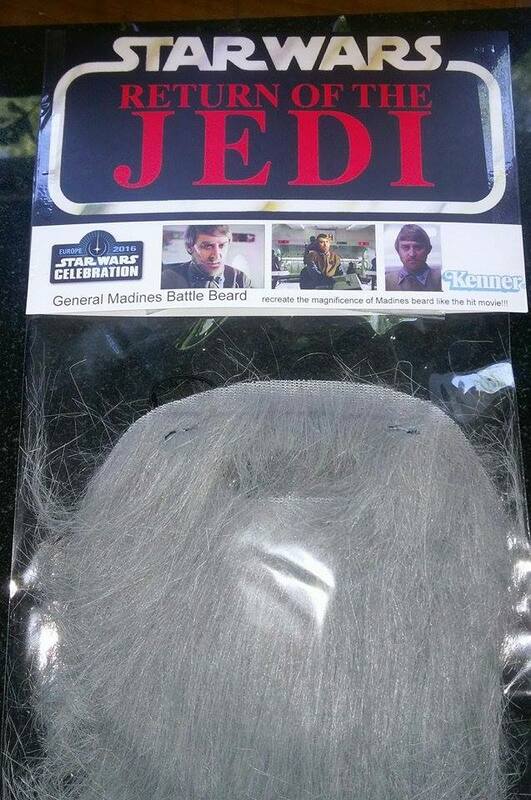 Has Chewbacca ever looked more the playa? 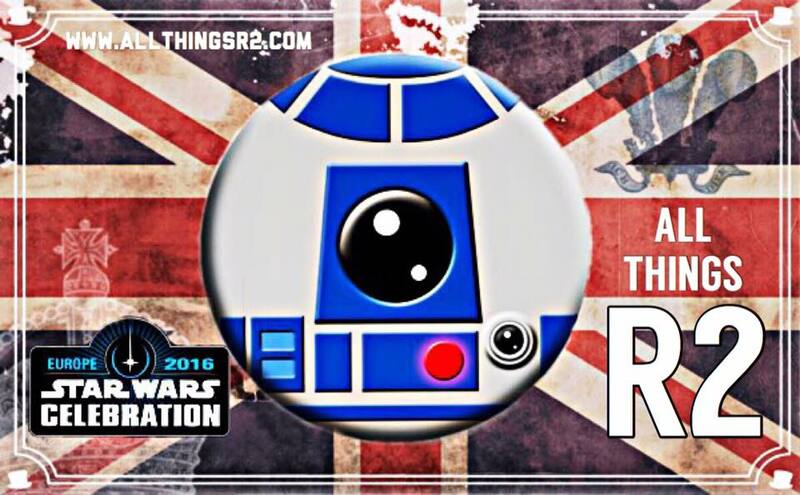 And why is R2-D2 getting all cozy with that Stormtrooper? 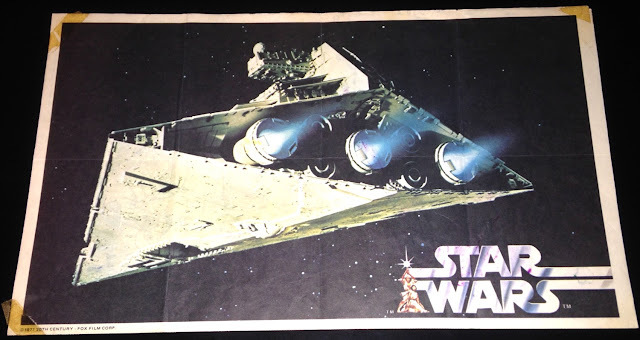 Like the image used on the previous poster, the Star Destroyer that appears on this poster should be familiar to most collectors: It appeared on the box of Kenner's die-cast Imperial Cruiser toy. The reverse of this particular example has been vandalized by a young Fauvist by the name of Dawn Elizabeth Rankin. 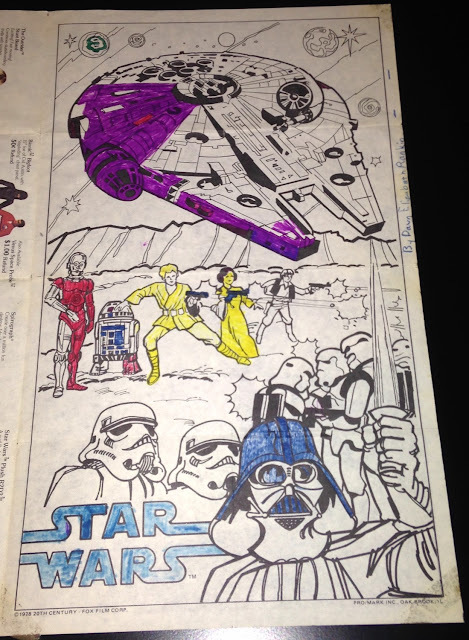 Hey, Dawn: You only get to sign it if you finish coloring it. Dawn went on to call herself a hairdresser even though she dropped out of beauty school a mere two weeks into the program. As I mentioned above, each poster unfolds to reveal a second portion devoted to advertisements and a rebate form. 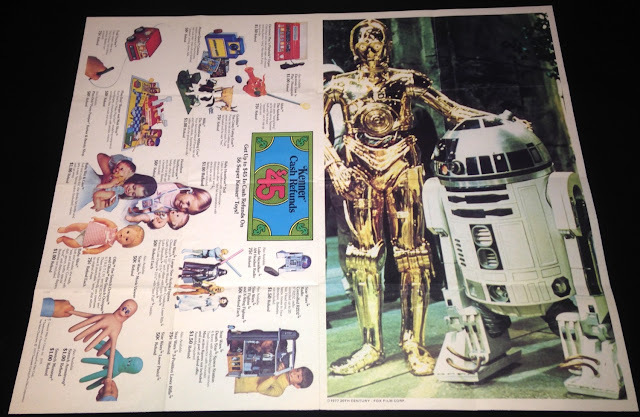 One side of this second portion features photos of the large-size Star Wars figures, the Radio Controlled R2-D2, and the Death Star playset in addition to a host of other Kenner toys. 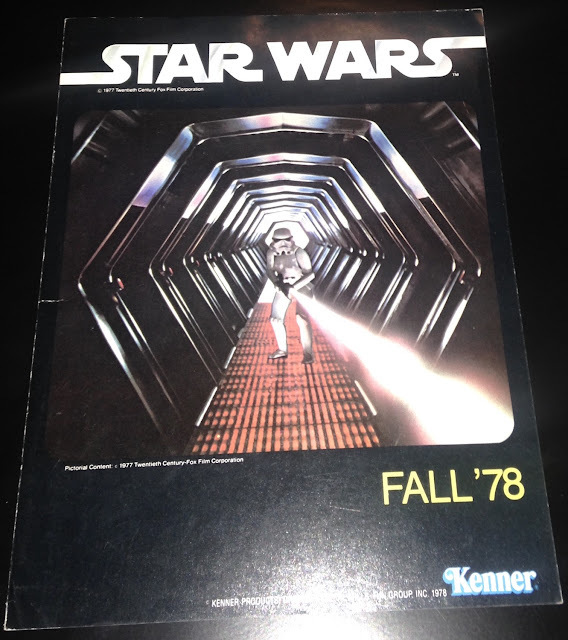 A photo of the Electronic Laser Battle Game adorns the opposite side. So do shots of the plush incarnations of R2-D2 and Chewbacca, though they're totally overshadowed by those fabled and irascible titans of plush, the Munch Mates. You're familiar with Munch Mates, right? Please don't tell me you've never heard of Munch Mates. 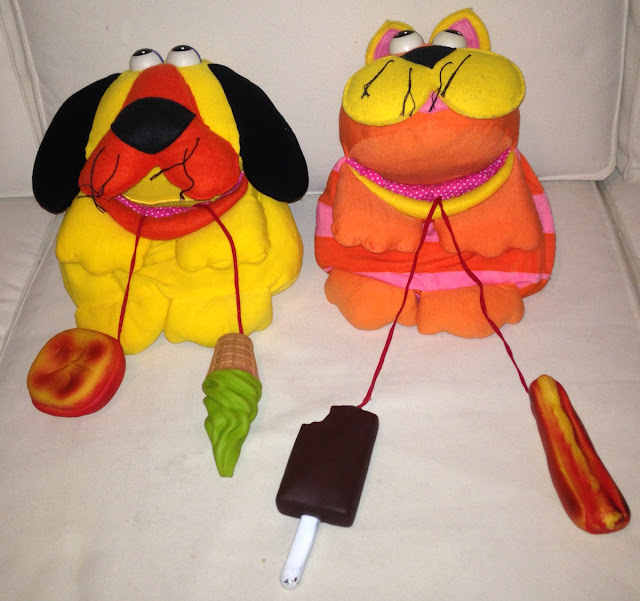 Munch Mates were a duo of plush varmints, named Snack the Cat and Chow Hound, that boasted an aesthetic right out of a Sid and Marty Krofft production. Their killer app was a huge mouth, into which kids could stuff molded rubber food items. And then pull them back out. 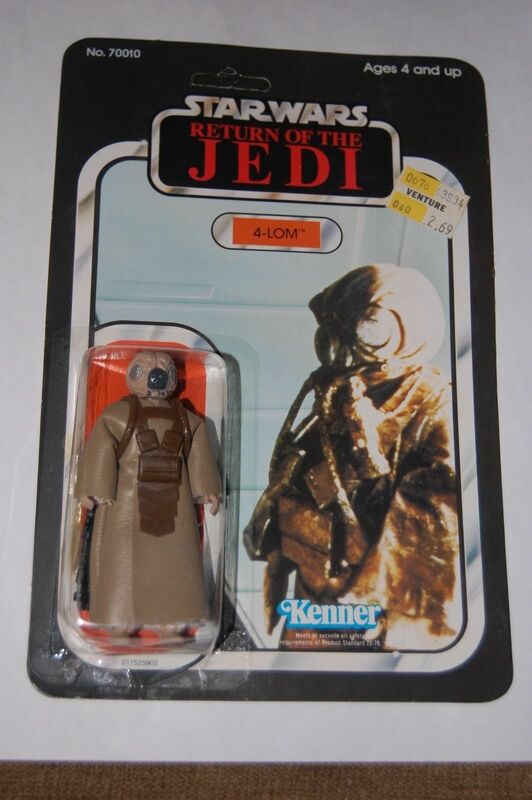 Unfortunately, Kenner's foray into the lucrative world of bulimia-themed toys was relatively short-lived. 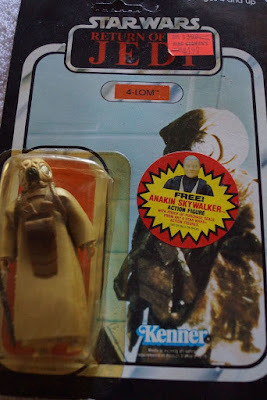 The Munch Mates disappeared from store shelves faster than a fashion model returns from the Ponderosa bathroom and lines up for seconds at the buffet. Above I mentioned an ad that ran in papers in support of the promotion. Here's one of those ads. This particular example appeared in papers in the Modesto, California area on November 19, 1978. 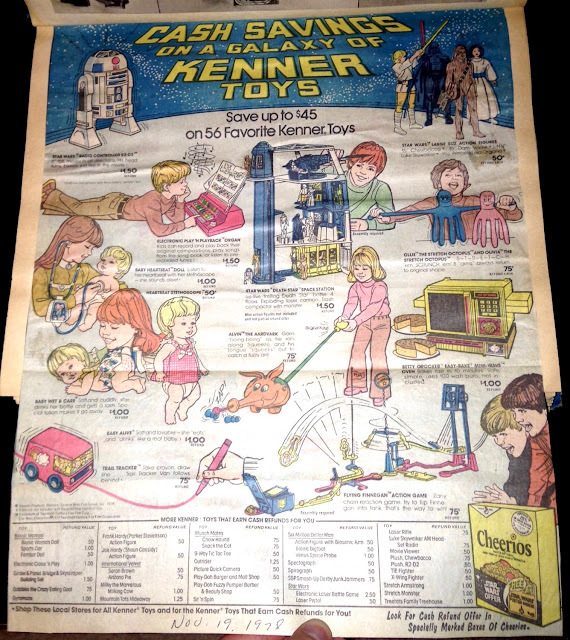 The star-field at the top of the ad and the use of the word "galaxy" leave no doubt as to which toy line ruled the Kenner roost during the late '70s. Is it possible the Flying Finnegan Action Game inspired a level of happiness anywhere near that implied by the ad's imagery? Does a Munch Mate keep his fudgsicle down after swallowing it whole? 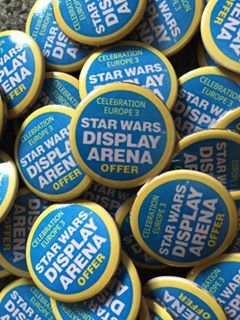 Lastly we have a large display used to advertise the promotion in grocery stores. It's one of those items at which you look and think "it could have been so much cooler." 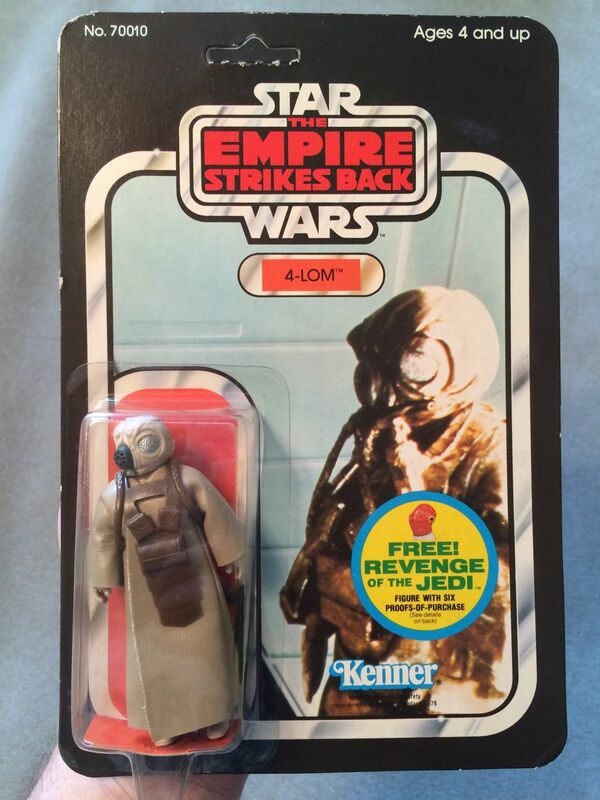 If only it used the Kenner logo. 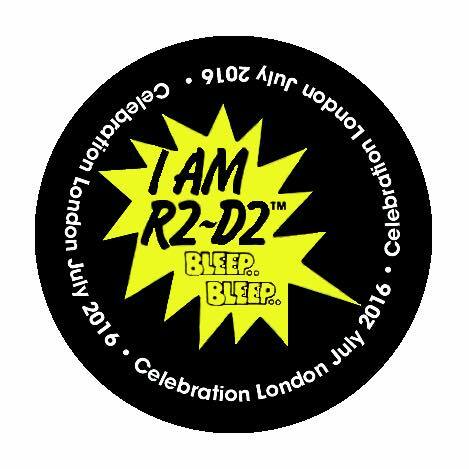 If only it included photos of Star Wars toys. If only I could still get that rebate on Munch Mates!